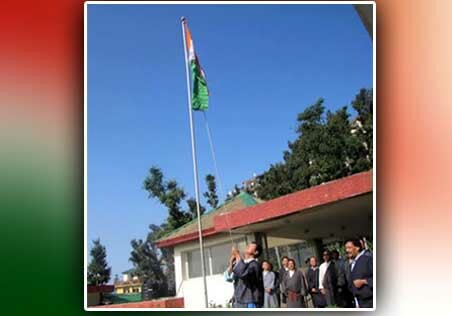 Dharmshala : Dr. Lobsang Sangay, the democratically elected political leader of the Tibetan people, congratulated India on its 69th Independence Day at a brief ceremony held at the Cabinet secretariat today. The ceremony was attended by members of the Cabinet of Tibetan government in Exile and secretaries and senior officials of all the departments. “On the 69th anniversary of India’s independence day, I would like to wish the government and people of India a very hearty congratulation,” Sangye said. “Since its independence in 1947, India has made a lot of progress. From a developing country, it has risen to a great power. The international community also recognises India as a great democratic nation, as you can see from the respect that the Indian prime minister garners during his travels abroad,” he said. “The successive governments of India and the different political parties have always supported the just cause of Tibet. The Central Tibetan Administration as well as the largest population of Tibetan refugees is based in India. Therefore, we are immensely grateful to this great nation for the kindness and generosity that it has shown to the Tibetan people,” he added. Tea and sweets were distributed after the ceremony. Following the ceremony, Sangye left for Police Grounds in Lower Dharamshala where the local Indian administrative office is hosting a similar ceremony to mark the occasion.